In a single season of major-league baseball, in 1890, John Keefe compiled a 17–24 pitching record for the Syracuse team of the American Association. After pitching in the minor leagues in 1891, Keefe left baseball and returned to his hometown in Massachusetts to live an ordinary life as a mill worker. John Keefe’s father was a blacksmith in the West Fitchburg section of town, where woolen mills dominated the local economy. Once the Keefe children reached their teenage years, they left school to work in the mills to help with family finances. After Keefe’s father died in 1876, his mother supplemented the children’s mill wages by taking in boarders at their house on Sanborn Road. It is unclear how much schooling Keefe received; in 1880, at age 14, he was still in school, but by 1888 he too was working in the mills. When not toiling in the woolen mills, Keefe excelled on the baseball diamond. The left-handed pitcher gained some regional renown in 1887, when he pitched for the Fitchburg team in the amateur Massachusetts State League. In the spring of 1889, Keefe pitched a few games for Holy Cross College, located 30 miles south of Fitchburg, in Worcester. When Keefe pitched well in two games against the Worcester minor-league team, Con Murphy, a Worcester native then pitching for Syracuse in the International Association, recommended him to his manager, Jack Chapman. 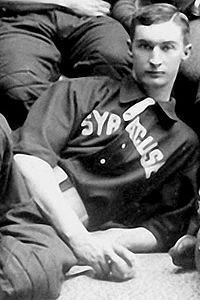 Chapman signed Keefe to play for Syracuse for the 1889 season. In the 1890 Fitchburg Directory, Keefe’s occupation was now listed as “ball player” rather than woolen mill worker. Keefe pitched well for Syracuse in 1889, compiling a 25–16 record. His 25 wins were fourth-best in the league. The pitching duo of Keefe and Murphy, who had 28 wins, led Syracuse to a second-place finish in the league. For the 1890 season, Syracuse moved up in stature to the major-league American Association, where Keefe struggled to a 17–24 record. His 24 losses tied for worst in the league. After Syracuse released Keefe in February 1891, he signed with Denver of the Western Association. When Keefe posted a 2–10 pitching record for Denver, he was released; he then pitched briefly for Omaha and Kansas City in the same league. After the end of the 1891 baseball season, Keefe returned to Fitchburg and married Nellie Cody on November 19, 1891. As a married man, he gave up professional baseball and returned to work in the woolen mills. However, he did continue to play baseball for semi-pro and summer-resort teams in the region. Sporting Life printed a small item in 1894, which noted that Keefe was playing with the Worcester County Unions. Keefe worked in the woolen mills of Fitchburg for more than 30 years. At some point, after the textile industry suffered hard times in the 1920s, Keefe became the operator of a gasoline filling station. At the gas station, he faithfully listened to the Boston ballgames on the radio every afternoon, according to his obituary in the Fitchburg Sentinel. John Keefe died on August 9, 1937, in Fitchburg. He left as survivors his wife, his younger brother, and one older sister; he and his wife did not have any children. Keefe is buried in St. Bernard’s Cemetery in Fitchburg. “Holy Cross Hopeful,” Boston Globe, February 24, 1889. “John T. Keefe, Former Hurler, Dies Today, 70,” Fitchburg Sentinel, August 9, 1937. Baseball-Reference.com, John Keefe playing record. Massachusetts State Archives, birth, death, and marriage records prior to 1910. U.S. Census Bureau, federal census, 1870, 1880, 1900, 1910, 1920, 1930. 1 Fitchburg city records show that a John O’Keefe was born on May 4, 1866, to parents Daniel and Ann (Duffy) who lived on Sanborn Road in West Fitchburg. All the names and places fit, except the “O” prefix to Keefe, leading to the conclusion that the recording clerk misinterpreted the Irish accent of the reporting parent. Additionally, in his 1891 marriage record, Keefe listed his parents as Daniel and Ann (Duffy) and reported that he was age 25, thus indicating an 1865 or 1866 birth date. In the 1900 federal census, Keefe reported his birth date as May 1866. 2 Two examples are articles in Sporting Life on June 22, 1889, and in the Omaha World Herald on February 8, 1891. 3 Death records in the Massachusetts State Archives of John’s father, Daniel, in 1876 (Volume 285, Page 346) and of Tim’s father, Patrick, in 1887 (Volume 383, Page 213) show they had common parents, Timothy and Catharine Keefe.